Quick post today. I didn’t do that much shopping this past Black Friday, not that I ever do that much. I think the most I spent on this shopping tradition is around $200 in 2011, when I finally bought a Xbox360 (250GB model, no Kinect), years after its initial launch. I usually just buy some movies and games. Perhaps some TFs. I have documented my Black Friday purchases before on this blog, in 2010 and 2013. So yeah, this year was also fairly light in terms of Black Friday spending. 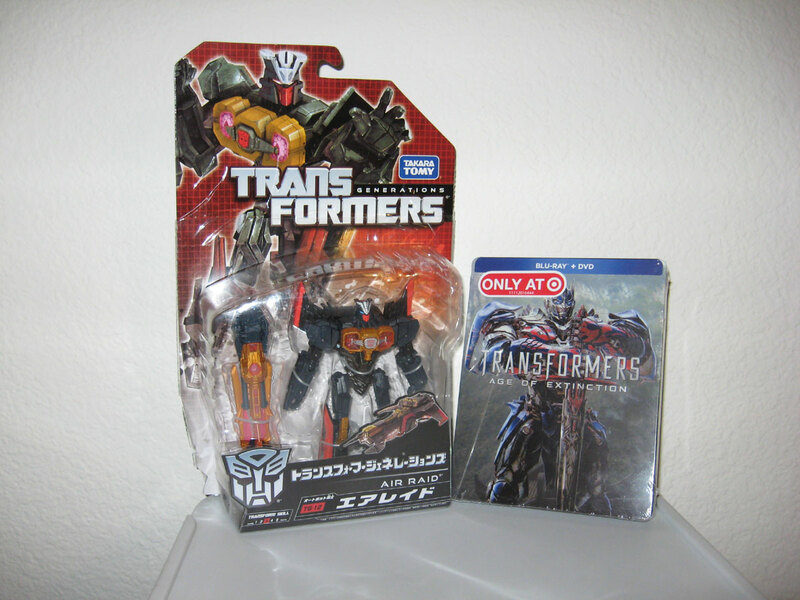 Out of all the items I got, only 2 are Transformers related. They appear below. The Age of Extinction Blu-ray is the Target Exclusive version with the metal case. I saw this starting on the Monday leading up to Black Fri, but at that time it was $13. At this price it was still a good deal, but I really didn’t like the movie that much so I hesitated. I’m glad I did, because on Black Fri it was only $9. At this price it was a no brainer for me. The figure here is the Japanese version of Generations Fall of Cybertron Air Raid. I have the US version, and I have written a post on the figure. This Japanese version is the exact same mold, but different color. Many fans feel this is a more G1 accurate rendition of Air Raid in his famous black base color. I bought this for $17.80 on Amazon with free shipping. I’m not sure if this was a Black Fri deal, but I got him over the weekend so it counts. Air Raid has become the most famous Aerialbot, or at least the most re-made. There’s an Air Raid in almost every TF continuity. Sometimes you see Silverbolt. I’ve never seen Sky Dive, Slingshot, or Fireflight outside of G1. Hasbro, how about giving these guys some love? That’s it for now. Transform and Roll Out.